Like most large, long-lived animals, White-tailed Sea Eagles are slow to mature and have low breeding rates. Sea eagles reach maturity at about five years of age and usually commence breeding at 5-7 years, although birds have bred for the first time as young as three. Individuals acquire the characteristic white tail of the adult at 4-5 years and pair formation may often begin in the year prior to first breeding. Studies of populations with individually marked birds suggest that most form long-term year-round pair bonds. However, when one mate of a pair dies or disappears, s/he is replaced with a new mate. 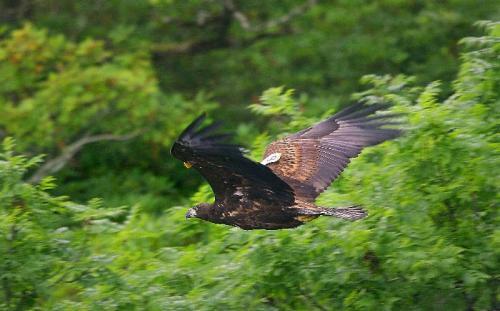 White-tailed Eagles lay 1-3 eggs although most clutches are of two eggs. Both sexes contribute substantially to parental care although females do most incubation and brooding of young chicks. Males bring food for females to feed to young for the first 3-4 weeks after hatching, after which both forage and feed young. Parents provide food for young for some weeks post-fledging before young disperse.